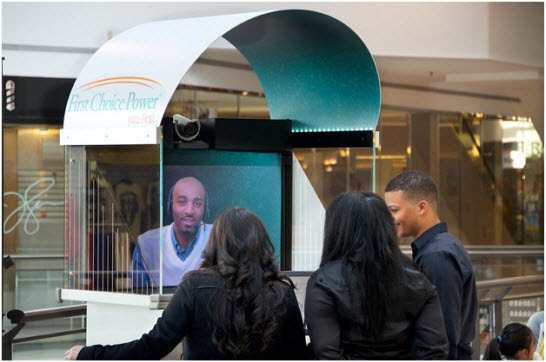 Videoconferencing Kiosks: Finally Ready for Prime-Time? May 22, 2012 | David S. Maldow, Esq. I was recently delayed while traveling (see below left). I really wanted face to face customer service, but the line to the two agents at the gate consisted of literally every other person on that large flight. The line hit the bookstore, curved around the bathrooms and stretched down the hall to the sad little airport bar. I was not about to wait on that. My only other option was audio only customer service (see below right). I eventually got to my destination, but it was a long stressful day. Face to face customer service would have made it better. I wanted reassurance that someone cared about getting me on my flight, and I wasn't feeling it over the phone. So where was the video kiosk? This is 2012, they should be everywhere by now, right? Videoconferencing technology today is certainly reliable and affordable enough to support the kiosk model, yet adoption remains slow. Well, it turns out that kiosks are a little trickier than the videoconferencing industry thought. The good news is that a number of pioneers are emerging to overcome the obstacles that keep us talking to the impersonal disembodied voices of yesteryear. 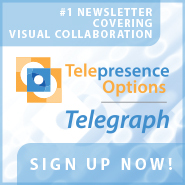 David Allen is a telpresence industry pioneer. He co-founded the first commercially successful telepresence company (TeleSuite) with Array Telepresence president Herold Williams in 1993. The company morphed into Destiny Conferencing which licensed its patents to HP for HP Halo, starting the wave of Fortune 500 providers entering the industry. Destiny was later sold to Polycom for $60 million. David Allen then successfully spun out the managed services side of Destiny Conferencing into Iformata Communications. The company, headed by scion Scott Allen and his equally talented wife Rebekah, was recently sold to AVI-SPL for an undisclosed sum. It is Mr. Allen's managed service knowledge which may be the key piece to the kiosk puzzle. The technology itself has arrived. Today's codecs can finally provide high-definition videoconferencing sessions over the bumpy public internet at affordable price points. However, the front-end technology is only part of the kiosk puzzle. The tricky part is managing the call behind the scenes. For example, let's say a video kiosk in installed in your local bank. What happens when someone walks up to the kiosk? How does it know how to direct the call? Ideally the customer would be connected to the right expert depending upon his needs, whether that be an investment advisor, loan specialist, etc. Banks love the idea of video kiosks (try to find a bank that hasn't attempted a kiosk trial program), but banks do not want to get into the business of video call routing. The Duffie White / David Allen combination holds promise. The high-quality TelePresence Tech kiosks powered by cost-effective internet-friendly codecs, supported by a sophisticated backend for cost-effectively routing the calls to the proper experts may be the solution that the industry has been looking for. The system is called: LIVE for Live Interactive Video Engagement and the goal is to cost-effectively leverage subject matter experts around the world at the speed of light. 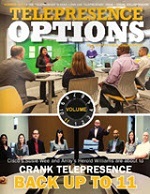 TelePresence Tech is shifting from being a leader in telepresence R&D to being a leading provider of telepresence kiosk solutions. As mentioned previously one of the missing pieces of the puzzle has been the middleware that provides the same telephony functionality for video calls that customers are use to when talking to voice agents: hunt groups which splits the call to multiple agents, call forwarding, video mail, and other tools that allow for cost-effective call center operations. Austin, Texas-based Vyopta is a pioneer and Alfredo Ramirez, CEO of Vyopta was kind enough to give us the skinny. Vyopta is a Cisco partner and uses Cisco gear for its kiosk solutions. Their "Remote Expert" solutions have been deployed in the telehealth, financial, sales and legal fields. The photo above displays a Vyopta kiosk deployed in the San Antonio Municipal Court to allow traffic offenders to play their tickets (see YouTube video below). Eventually, the city plans to connect other services to the kiosks, allow its citizens to take care of a variety of government related business without having to run between various government offices. Commercial enterprises, such as Yahoo, are also using Vyopta kiosks for virtual reception. Vyopta's workflow engine is based on business rules to support call routing. Each pool of agent resources is defined by the system, and kiosk visitors are able to connect to the first available support person at each pool. The Vyopta solution also supports recording and analytics, customer surveys, digital signage, and other features. Mr. Ramirez explains their model: "We develop applications that enable enterprises to adapt Cisco video/telepresence to transform how they serve customers, which is essential in achieving significant advancements in customer services, operational efficiencies and financial performance. Enterprises require comprehensive video/telepresence solutions that adapt to their specific workflows, offer a simple user experience, and deliver business intelligence -- all essential to improving overall business performance and outcomes." Another emerging player is Nexistant. With an initial focus on lobby reception and concierge services, the company offers its Virtual Attendant solution, which is powered by Vidyo's internet-friendly H.264 SVC software-based videoconferencing client. Nexistant's cloud service likewise routes video and control data to a remote "agent", who is selected in real-time based on skills, availability and location. Allowing a small group of receptionists to handle dozens of reception areas from one location, the Virtual Attendant solution provides cost savings along with flexibility for services like extended hours of coverage and language support. A kiosk supports numerous functions such as badge dispensing and signature capture (see table below), controlled by the remote receptionist. The result is a full service virtual receptionist, who can do a lot more than answer questions. "It's easy to see that there are a lot of exciting applications for this technology. To reach them, we are building an ecosystem of partners who have the expertise in the hardware and service components of the solution while we focus on the cloud services", says Larry O'Connell (CEO of Nexistant). Nexistant understands that virtual reception is the "low hanging fruit" for the industry and is focusing their efforts accordingly, with several deployments planned for Fortune 500 companies starting this summer. (see YouTube video below). For too long the industry's focus has been replicating across-the-table business meetings. Board rooms, small team collaboration, B2B, etc. have dominated the conversation. But the power of video goes way beyond the boardroom. 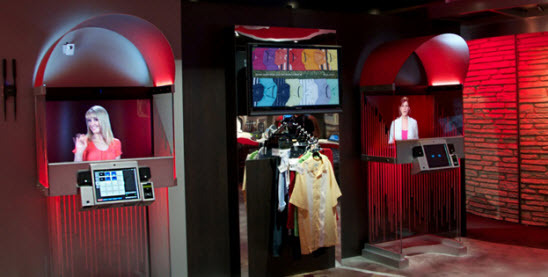 Many players are developing innovative uses for video and kiosks seem like the next market segment ready to shine. The untold story is that both small and large players have been testing video kiosks for years under the radar and many are using them successfully today. We know of a retail deployment with a reported 40% sell through, and several retailers are working with all three of these vendors to offer widespread deployments in drugstores, banks and retail chains (see the banking kiosk case study video below). Emily Magrish, an industry veteran who has helped champion many of the pioneer efforts sums up the long journey: "It has taken twenty years, but we are finally at the point where we are ready to use video as a business tool to reach consumers, not just limited to conventional meetings." We strongly agree and look forward to a fully video powered business world. Like the Hertz deployment in 30 cities today (see YouTube video below), expect to see these at car rentals, airports, wireless stores, electronics retailers - or a store near you very soon". David Allen is a telpresence industry pioneer. He co-founded the first commercially successful telepresence company (TeleSuite) with Array Telepresence president Herold Williams in 1993. The company morphed into Destiny Conferencing which licensed its patents to HP for HP Halo, starting the wave of Fortune 500 providers entering the industry. Destiny was later sold to Polycom for \$60 million. David Allen then successfully spun out the managed services side of Destiny Conferencing into Iformata Communications. The company, headed by scion Scott Allen and his equally talented wife Rebekah, was recently sold to AVI-SPL for an undisclosed sum. As mentioned previously one of the missing pieces of the puzzle has been the middleware that provides the same telephony functionality for video calls that customers are use to when talking to voice agents: hunt groups which splits the call to multiple agents, call forwarding, video mail, and other tools that allow for cost-effective call center operations. Austin, Texas-based Vyopta is a pioneer and Alfredo Ramirez, CEO of Vyopta was kind enough to give us the skinny. Vyopta is a Cisco partner and uses Cisco gear for its kiosk solutions. Their \"Remote Expert\" solutions have been deployed in the telehealth, financial, sales and legal fields. 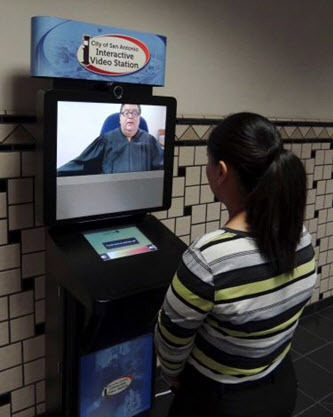 The photo above displays a Vyopta kiosk deployed in the San Antonio Municipal Court to allow traffic offenders to play their tickets (see YouTube video below). Eventually, the city plans to connect other services to the kiosks, allow its citizens to take care of a variety of government related business without having to run between various government offices. Commercial enterprises, such as Yahoo, are also using Vyopta kiosks for virtual reception. Mr. Ramirez explains their model: \"We develop applications that enable enterprises to adapt Cisco video/telepresence to transform how they serve customers, which is essential in achieving significant advancements in customer services, operational efficiencies and financial performance. Enterprises require comprehensive video/telepresence solutions that adapt to their specific workflows, offer a simple user experience, and deliver business intelligence -- all essential to improving overall business performance and outcomes.\"
Another emerging player is Nexistant. With an initial focus on lobby reception and concierge services, the company offers its Virtual Attendant solution, which is powered by Vidyo's internet-friendly H.264 SVC software-based videoconferencing client. Nexistant's cloud service likewise routes video and control data to a remote \"agent\", who is selected in real-time based on skills, availability and location. 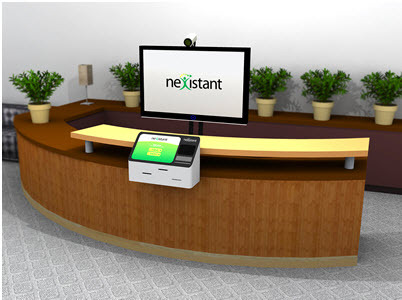 Allowing a small group of receptionists to handle dozens of reception areas from one location, the Virtual Attendant solution provides cost savings along with flexibility for services like extended hours of coverage and language support. A kiosk supports numerous functions such as badge dispensing and signature capture (see table below), controlled by the remote receptionist. The result is a full service virtual receptionist, who can do a lot more than answer questions. Emily Magrish, an industry veteran who has helped champion many of the pioneer efforts sums up the long journey: \"It has taken twenty years, but we are finally at the point where we are ready to use video as a business tool to reach consumers, not just limited to conventional meetings.\" We strongly agree and look forward to a fully video powered business world. Like the Hertz deployment in 30 cities today (see YouTube video below), expect to see these at car rentals, airports, wireless stores, electronics retailers - or a store near you very soon\".